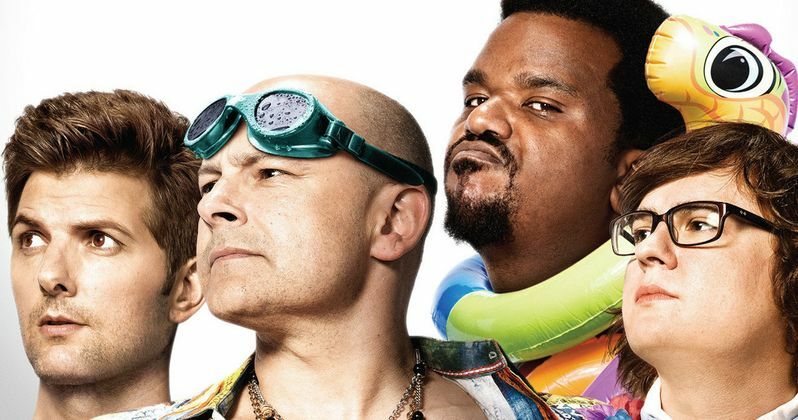 /comic-con-hot-tub-time-machine-2-red-band-trailer/After debuting a Red Band trailer at Comic-Con 2014 this past July, Paramount has finally released the official trailer for Hot Tub Time Machine 2. Craig Robinson, Rob Corddry and Clark Duke are back, and this time they are being joined by comedy favorites Adam Scott and Gillian Jacobs. The gang is also featured on a new poster from this awaited Valentine's weekend release. In Hot Tub Time Machine 2, Lou (Rob Corddry), having become a billionaire, finds himself in some dire trouble. Nick (Craig Robinson) and Jacob (Clark Duke) fire up the hot tub time machine in an attempt to get back to the past. But they inadvertently land in the future. Now they have to alter the future in order to save the past... Which is really the present. Does this sound at all confusing? Not to worry, Chevy Chase is also back has the handy hot tub repairman, and while he may not be too forthcoming, he does hold all the answers the guys need to save the future from the past. Check out the latest footage and the official one-sheet, then decide: Are you taking your significant other to see Fifty Shades of Grey this Valentine's weekend? Or will you treat yourself to the first big comedy sequel of 2015?